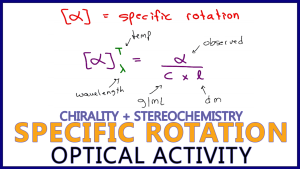 Specific Rotation calculations are a useful tool in optical activity. This video will help you understand the factors influencing specific rotation such as observed rotation, g/mL, path-length, wavelength, and temperature. You will see a detailed breakdown of the equation along with a few examples to follow along. This is the 2nd of 3 Optical Activity videos in the Stereochemistry Series. Click HERE for the entire Chirality/Stereochemistry series.